These are usually cheaper €1-1.50 for a small cup. 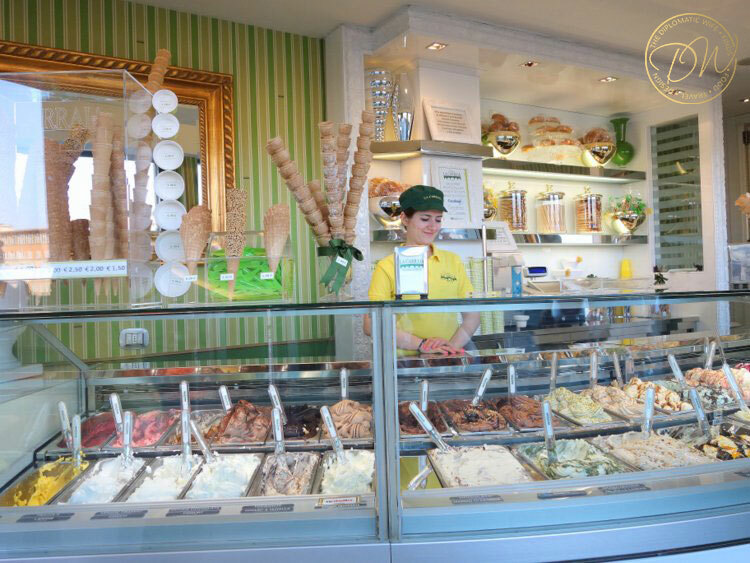 If there is a seating area and toilet for customers, then the prices for gelato are higher. It’s always a good idea to ask how many flavors you can have in the cone/cup you chose so you can try several flavors in one go. Of course, we didn’t realize this until our stay in Firenze was almost over. Gelato, whather it’s artisanal or mass-produced, is usually always good. But when you are in Italy, don’t sell yourself short. 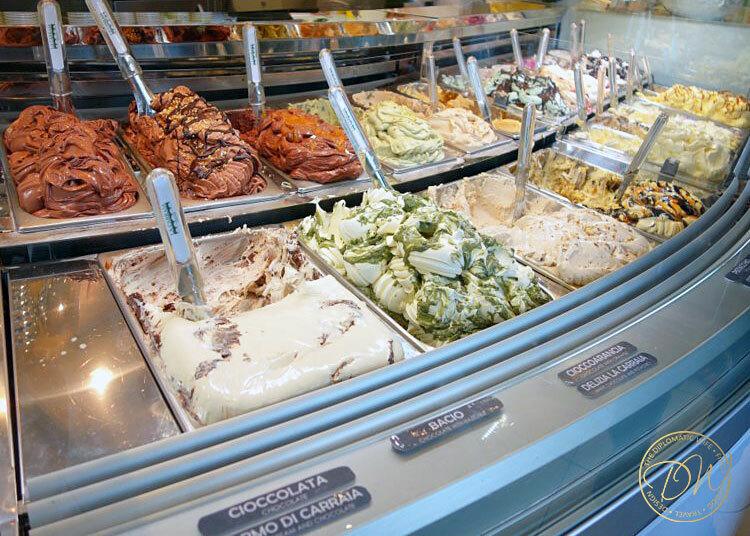 Go for REAL homemade, high-quality fresh gelato or gelato artigianale. Once you’ve tried it, you will know what I mean. 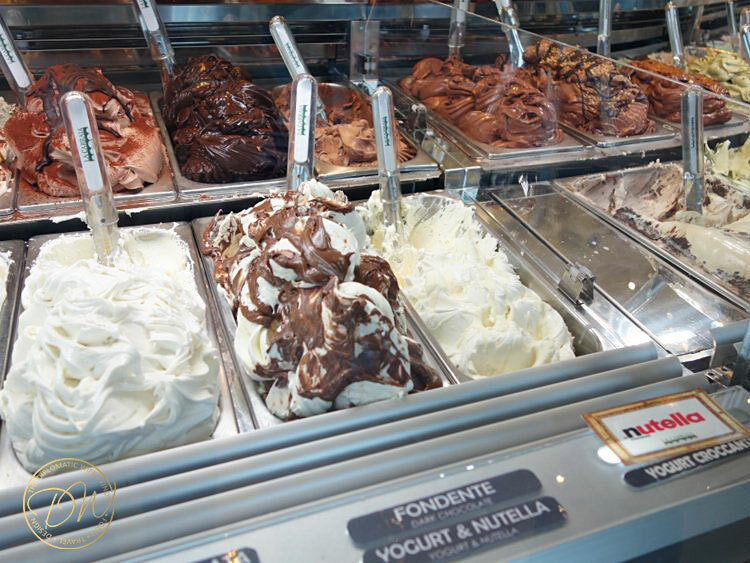 I am not a gelato connoisseur or expert, but the these are the general tips that we followed. 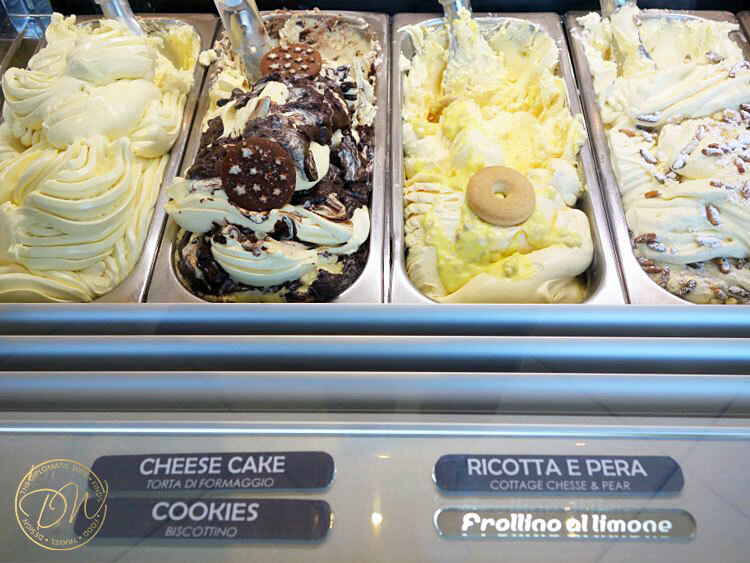 Beware of gelateria’s that have towering mounds of gelato because though they look impressive, they are telltale signs that chemicals were added or that it was frozen solid, reducing the quality and taste. Another sign of good gelato is that they are in metal containers. 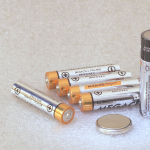 Plastic containers usually mean that they contain food stabilizers. It’s even better sign when there are metal lids covering the gelato because it protects the gelato. 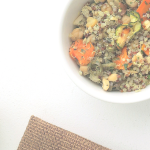 Color should be the natural (most of the time duller) color of the fresh ingredients. Don’t be attracted by bright, artificially-colored gelato. Beware of hard or frozen looking gelato. Soft and served with flat paddles is the way to go. We didn’t stay long enough for such a long and comprehensive list. 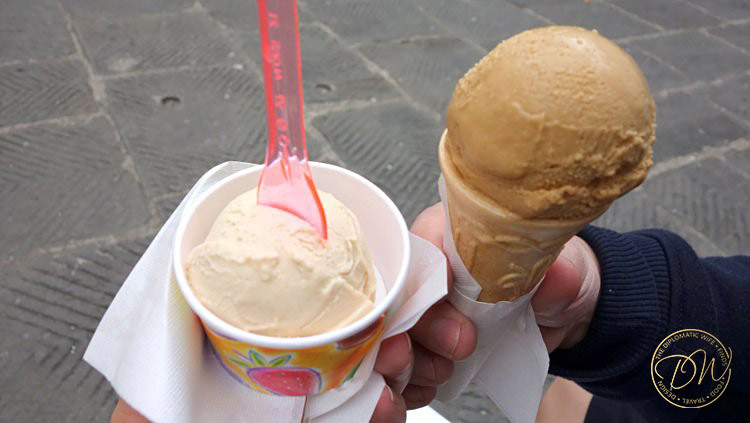 We tried to go to different gelaterias each day that we were there and below are our 3 most memorable gelato experiences in Florence. 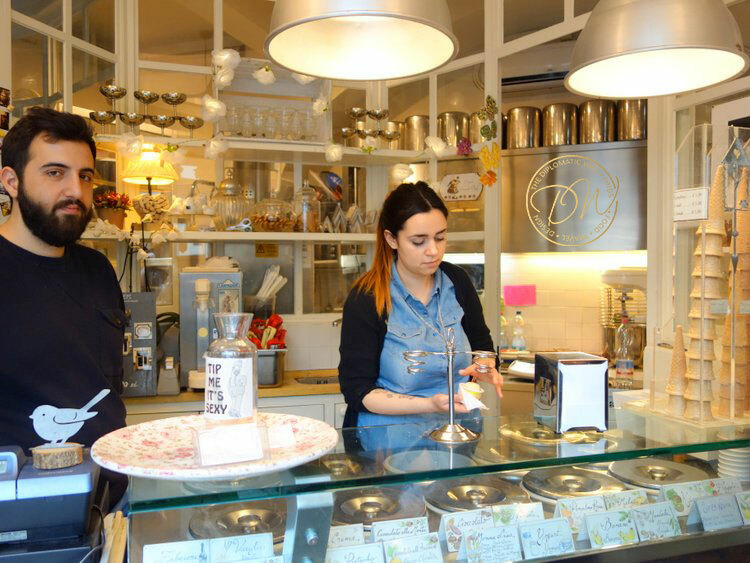 For TD and me, the flavors of Gelateria La Carraia were the best we had in Florence. 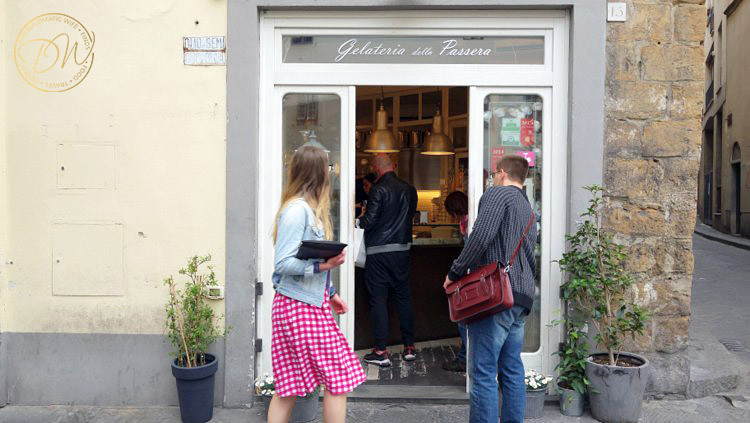 It was recommended to us by our host Luca and once we tried it, we just kept coming back. There are two locations, with the bigger original one in Piazza Nazario Sauro. 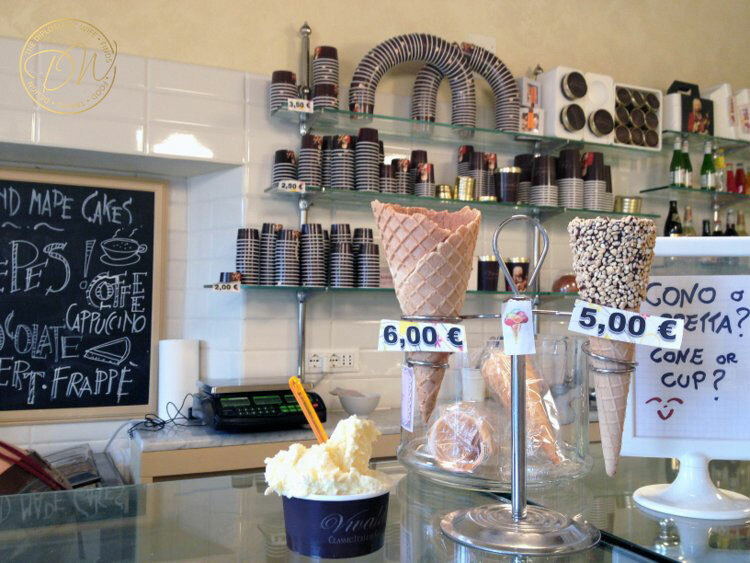 The small gelato cup is € 1.50 and you can get up to 2 flavors. I love the contrast of cream and chocolate flavors. The Marmo di Carraia and stracciatella were amazing! TD is drawn more to chocolatey flavors and he loved the Nutella Bacio (chocolate with hazelnut) and Fondente (dark chocolate). 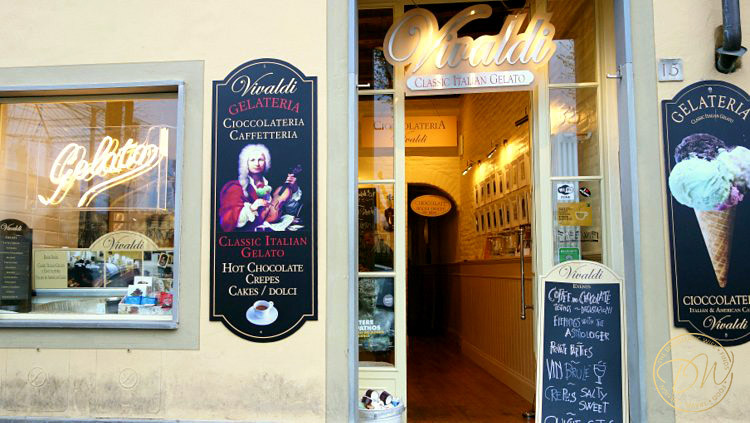 We passed by Vivaldi as we were on our way to a fabulous goldsmith’s shop. 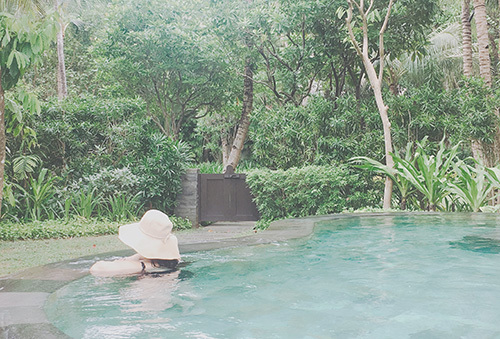 We left the goldsmiths without any gold and it was time for one of our many babymoon breaks (meaning: mini meal + rest preggy feet + pee-break). 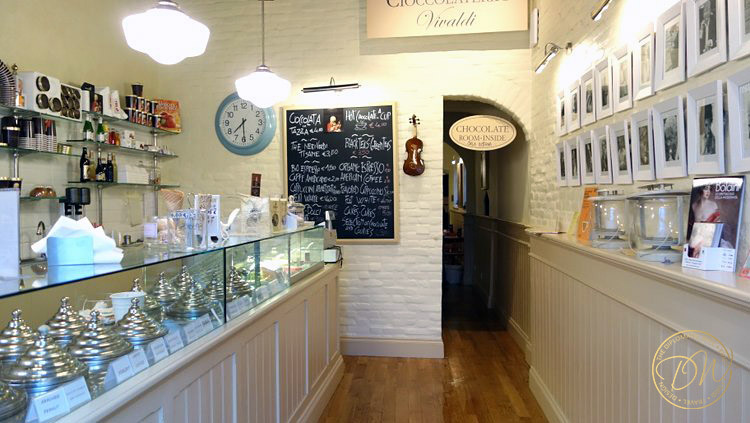 Luckily Vivaldi Gelateria had a big seating area in the back, a toilet and, most importantly, gelato! If you notice the gelato has metal covers. 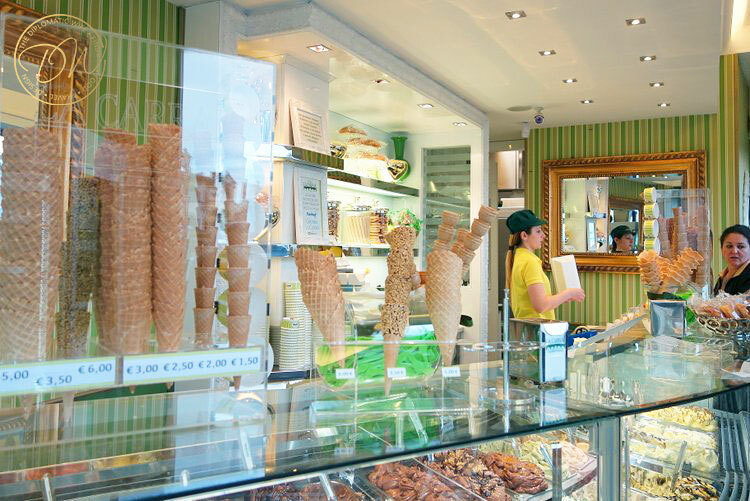 Here we finally tried the chocolate dipped cone covered with hazelnuts… with hazelnut flavored gelato of course. The cone was € 5 but you can choose a couple of flavors or get one massive scoop like we did. It was delicious, but the standout gelato flavor was the Lemon Cream € 2 for a small cup. It was so good and tasted like an ice cream version of Lemon Cloud Cake, my favorite cake in Berlin. 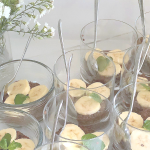 It is not tart, but the perfect balance of sweetness, creaminess and fresh lemon. Even TD, who does not like fresh fruity flavors in his gelato, gave this flavor two thumbs up. We stumbled onto this gelateria at the perfect time. It is infront of a nice uncrowded square. It was the perfect place to take a break and cool off with some ice cold treats. It’s tiny, but the interiors were charming, and the ice cream flavor labels were beautiful. Oh and they had metal covered tins. TD and I are drawn to sweeter not-so-tart flavors. I had Hazelnut which was good, and TD had coffee which was very good, but nothing mind-blowing. Each scoop was only 1 Euro. 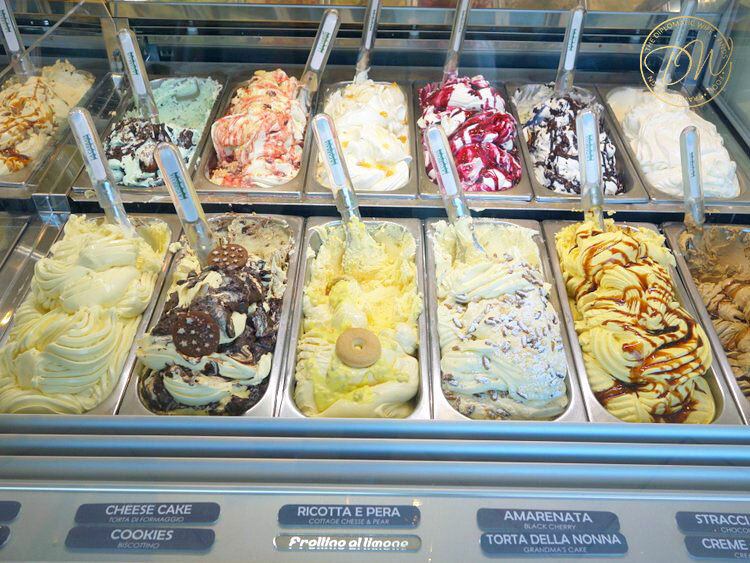 This small off-the-beaten-path artisanal gelateria has some really amazing reviews on tripadvisor, but the rave reviews came mostly from fresh or fruity flavors so we probably ordered the wrong flavors. If I had the chance I would go back and order something with mint, lavender or rose. 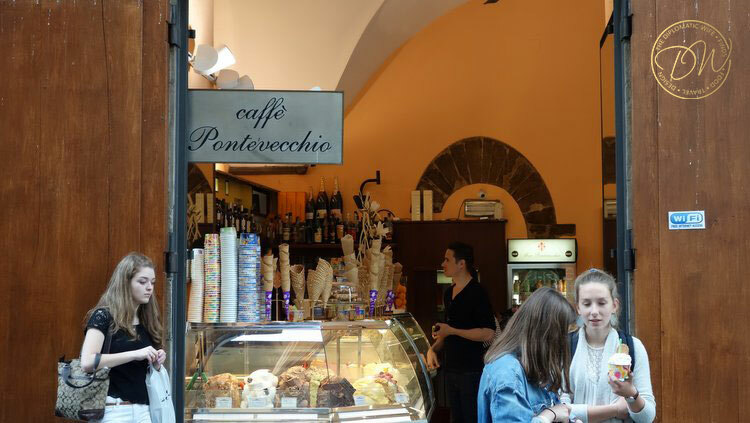 What made the experience memorable for me is the discovery of a charming little gelateria after the hustle and bustle of Ponti Vecchio and being able to enjoy it in a lovely little square while watching locals hang out. Have you ever had real artisanal gelato? Where was it from and what flavor was it? I would love to hear from fellow gelato lovers! I glossed over the post, stopping myself because I am an ice cream / gelato fiend. I just downed 5 pints of Ben & Jerry’s ice cream in ONE WEEK! I’m glad you like the tips! Can you believe that was not really into ice cream before? Unless someone put ice cream in front of me, it never occured to me to buy ice cream for myself. Even when I worked in Nestle Ice Cream and was the one who was in charge of creating new flavors haha, I tried to avoid daily taste testing! But TD has totally changed all that and taught me how to appreciate ice cream and gelato. There is no going back! HAHA. I absolutely love Ben & Jerry’s Cookie Dough! 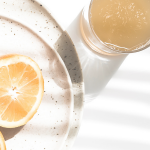 What are your favorite flavors?